Cauliflower soup is my all time favourite soup. Most people turn their noses up at it - especially as it has a bit of a tendency to smell - but for me it's in my top five comfort foods. My mum used to make it all the time when I was small and I can't think of anything better than a piping hot bowl of cream of cauliflower soup with deep fried croutons. In fact, I think it was the croutons that got me eating the soup. She used to make a huge pile of them and then hide them in the cupboard out of reach. I have hazy memories of snaffling a few each time I walked past the cupboard and then when tea time rolled around, there being none left and trying to explain that it was Herbie Hedgehog who ate them. Cauliflower itself, has a very delicate flavour and so most people associate it with the watery, overcooked texture of chain carvery restaurants and school dinners. Or with it being slathered with a pile of cheese sauce (another favourite of mine) thus rendering it as a low fat bulking agent rather than an ingredient in its own right. Even my mum's soup requires a fair bit of seasoning and the addition of leeks and celery to give it some depth of flavour otherwise it is just bland. A while back, as part of this challenge, I tried making Stilton and Cauliflower soup. Quite honestly, it was foul. The stilton overpowered the subtle flavours of the veggies and all in all it was a complete waste of good ingredients. Don't get me wrong, I like a bit of stilton with some bread or biscuits for cheese. But a bowl of runny, smelly-sock scented paste did nothing for me. That's the other thing about cauliflower based soups. They can get really thick and require a lot of thinning down. When I make my mum's soup, I just chuck in piles of veggies, a litre of stock and a pint of white sauce and it usually tastes pretty much the same, regardless of the cauliflower size. But seeing as how this challenge was to use a recipe, I followed it to the letter. Ocado sent me the world's largest cauliflower last week and so despite the recipe saying 'One large cauliflower', I feel that this particular cauliflower fell into the same large category as The Enormous Turnip. The soup was nearly thick enough to cut and I ended up adding another pint of liquid to it, just to get a reasonably soupy consistency. On the plus side, the flavours were amazing. 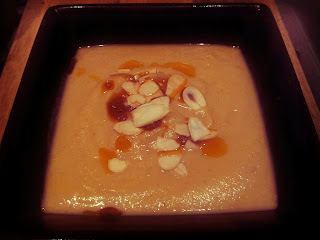 Harissa-spicy with the subtle flavour of coriander, cumin, cinnamon and toasted almonds, whilst still retaining the cauliflower undertones this soup really tickled my tastebuds. And as the husband was having curry, I ate the soup with one of Dan Lepard's Frying Pan Naans which worked really well. Cut 1 large cauliflower into small florets. Fry 2 tbsp oil, 1/2 tsp each of ground cinnamon, cumin and coriander and 2 tbsp harissa paste for 2 mins in a large pan. Add the cauliflower, 1 litre hot vegetable or chicken stock and 50g toasted flaked almonds.